The VersaMax Micro 64 supports 48k of user ladder logic programming. GE Fanuc Automation has released the VersaMax Micro 64 control system. The unit's design and construction provide robust performance and operation that minimise support costs. "The VersaMax Micro 64 provides a complete flexible and scaleable automation solution with a wide range of I/O expansion modules and a variety of communications options including Ethernet," said GE Fanuc Controllers Product Manager, Bill Black. "It is ideal for a wide range of packaging, assembly and SCADA applications that require performance at an affordable price." GE Fanuc also offers multiple operator interfaces and motion solutions for simple integration add-ons to the VersaMax Micro 64. For example, a common software programming and tag database for the operator interface and controller shortens engineering development time and simplifies overall system troubleshooting. 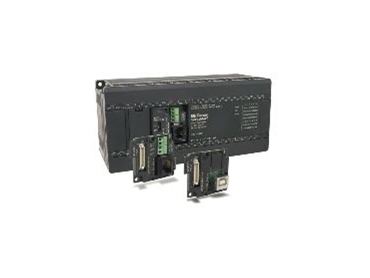 For motion applications, the unit supports four independent 65kHz Pulse Train/PWM outputs and can easily be adapted to GE Fanuc's line of PowerCube stepper amplifiers and motors or S2K servo controllers. The VersaMax Micro 64 High Speed Counter supports four independent 100kHz type A counters or one type B counter for precise motion positioning. The VersaMax Micro 64 supports a user-friendly Memory Module that can easily be connected to the controller to download the latest program changes without the need of a PC. The Proficy Machine Edition Logic Developer PDA software allows the user to interface a Palm handheld device to the VersaMax Micro 64. With Logic Developer PDA, it is possible to monitor/change data, view diagnostics, force ON/OFF and configure machine setup. The VersaMax Micro 64 Memory Module and Logic Developer PDA can save time and increase manufacturing productivity. The unit also supports a wide range of communication options that include serial (SNP, SNP Master, Serial Read/Write, RTU Slave and RTU Master, USB) and Ethernet (SRTP and Modbus TCP) enabling an easy interface to bar code readers, pagers, modems, Ethernet LANs, operator interfaces and more. The VersaMax Micro 64 supports 48k of user ladder logic programming and 32k of data registers. The abundance of memory enables the system to solve complex applications requiring multiple program storage and large data storage for faster setup time/changeover or system monitoring. The data can also be written to internal Flash to eliminate the need for a battery. The system is compatible with all VersaMax Micro expansion units. There are more than 25 discrete I/O expansion options (12Vdc, 24Vdc, 120/240VAac I/O and Relay Outputs up to 10A) and six analogue I/O expansion options (4mA to 20mA, 0 to 10Vdc, RTD - 2 and 3 wire type). The VersaMax Micro 64 meets global standards and is supported globally with GE Fanuc Automation sales offices and distribution channels. GE Fanuc also offers 24/7 technical support to speed development time and increase system uptime.